I meet a lot of interesting people. But meeting a Wand Maker was new for me. At least in this life. Steven White is from a long lineage of magicians who are capable of blending into society as muggles. I knew when I met him he was something else. Whether its the creative abilities that give a hint of his magical nature or that twinkle in his eyes. For sure it was clear that he had not succumbed to the gravity of a TV addicted society, or to the loneliness of cubicles and fantasy less politics. No, he maintained his true nature in a multi layered existence and continued what he could do best: making wands for the magician community. I was invited into his unusual round shaped home and then into his depot and atelier. Here he creates, measures, infuses, and decorates the very best wands that Canada has to offer. I was honoured to have been allowed into his domain and portray him, so his legacy may continue beyond this space and time. Definitely on of my most favourite places on earth. You might think I am some kind of epic wildlife photographer but the truth is those deer are very tame. They reside in a dune like area (reserved for water purification) somewhere in the Netherlands, grazing and making people smile. Made me smile at least. Such a lovely animals. Ontario track and field racing at the Waterloo Campus. Here Laurier Golden Hawk Track runner Emrys is trying to keep up with some insane fast students. 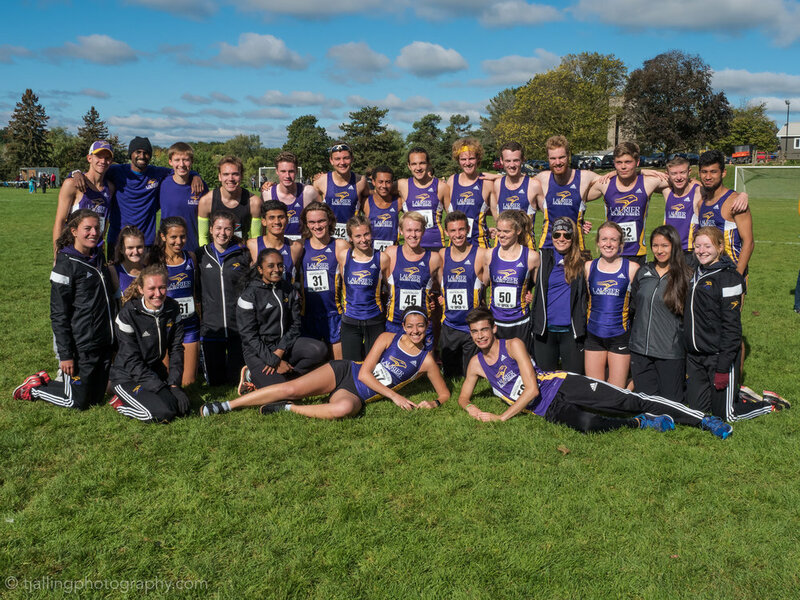 The track and field team of Laurier. I witnessed and photographed the CORK REGATTA in Kinston Ontario last fall. Optimists, Lasers, 420's and many more took the field on a beautiful autumn morning. Here are the optimist class boats going to their race field. I was standing there and suddenly I saw this image that many before me have seen too. For hundreds or thousands of years fisherman went out on to the sea while others stayed ashore and watched them spread out into the vast emptiness. Since I grew up in Holland (Netherlands) I have seen some old fishing ships take sea just like that. So here I saw this similar pattern of little boats scattering over the lake again. Just a wonderful moment. What you see below looks like green marble, but is in fact the whirling waters at the bottom of the Niagara Falls in Canada. The falls are very impressive, the buildings around it certainly not. An astonishing amount of water flows over a very large bow shaped ridge and pushes itself through this gorge shaped canal where tourists like me can make photos. Would love to have seen this place a 300 years ago. Still it is an amazing place! I have been making an album cover. The band is called "Half Moon Run" and the album selected was "Sun Leads Me On". It was a challenge, but I did it. This is my interpretation of their music on that album. Maybe next time they choose me to do their album, ha ha. I shot it in Toronto on a cold winters day. But listening to the album I felt that the presence of a sun was definitely needed amongst the winters capes and some melancholy. It was a pleasure to do this challenge and get to hear for me new Canadian talents along the way! Project "magazine" turned into a running magazine cover. Just because I love trail running. Trail running in the winter can be challenging but also very beautiful and pleasantly lonely. In this image I wanted to mix the difficult part of running through snow trails together with the energy that you get out of trail running in nature. The magazine is fictional, just in case you go shopping for it. I am passionate about food, and about making images of this necessary feast. The recipe is sweet potatoes from the oven with sage, and roasted sunflower seeds. Before you know it, fatherhood changes, and the father role transforms into memories. Children grow fast, relying on their own insights, starting to operate out of the safe space you provided. The most important thing I learned, and tried to sustain, is the support for my children's passions. No matter what passion, it's the strongest fuel to experience life and love. In return, passion reappeared in my life just when it had slipped away. But there is also play. Play and keep playing. It keeps the connection alive and breaks that little wall that might grow between us. Play and keep the joy in life and relations. And I have learned the importance of listening. Even when I thought I was right, or when I did not get it at all. Listening to my children and giving them my attention as an equal member of the family and no less than that. The initial project was "faith" but I like it better as "trust". Faith to me has to many old religious connotations which makes it less appealing to me than trust. As in trust into my Self. Trust that what I encounter is always right for me since I created this myself. Trust is also my step into the unknown, the key to unfolding new potentials. Interestingly trust can't be measured, and is not subject to the Laws of Nature like time and gravity (hence Newton’s apples). I also believe that you can't really do trust but rather have trust since trust is not rational and this is harder for the mind to grasp or to rely on. Still trust is a big game changer in my life. I love it. The mother or motherhood is watching over the sea, also called the "tears of mankind”, or all that is. Motherhood represents the feminine and encompasses care, heart and the connection to all that is. In this image I did not see the need to show children as they are always in a women's heart. Here she stands and reconnects with what feeds her, to pass it on to others in her life. Why did I make this image, which is just a copy of someones else his art? Well when I was at College one of my co students was a girl who immediately reminded me of this painting of Vermeer. Almost 2 years later I had an assignment to do which was recreating a classical painting. I knew what I was about to do. When finally I had Amanda (my classmate) in front of me, and dressed her in look a like clothes I suddenly was driven by an energy that I hadn't felt before in my photography. Everything fell into place, without any effort my camera and light position was spot on, the crew just did what it needed to do, bystanders came to help or expressed their surprise, the specific look she gave me was splendid and the final result was better than I expected. It was one of those rare moments that I suddenly found a fragment of my own style that I did not know yet. Looking further from that moment I have created a personal style that I feel excited about (look at my portrait section on this site). Funny that this classical painting assignment just triggered me to unlock something of myself. 17th century Dutch paintings are famous in the world of art. Some of the greatest artists have emerged from this specific era. How could this tiny Republic of the Seven United Netherlands become the birthplace for such a new wave of art? The emerging of the Golden Age, as the 17th century of the Netherlands became known, came at a hard fought price. Before the 1600s, the Dutch citizens had had an exhausting war with the Spanish invaders, that lasted eighty years. The end of the war in 1568 marked the beginning of a new time. The Dutch became politically aware and religiously tolerant. They seemed to have gained strength and self worth from their sufferings, and this may have caused the upraise of a more liberal way of believing, a new way of thinking, trading, followed by changes in art and artisanal work. The Vereenigde Oostindische Compagnie was established in 1602 as a trading company. From it's beginning until 1796, the VOC sent a staggering 4,785 ships out for trade over the world. It was the first multinational company ever. This development created prosperity and wealth in the Netherlands, attracting traders and scientists, and people who were persecuted elsewhere. These well-received immigrants brought knowledge and education. Cities like Delft, Amsterdam, Rotterdam and Utrecht expanded, and became uniquely shaped with beautiful houses and canals. Not only the few rich benefitted from the new-found prosperity, but more so the large middle class. The Dutch embellished their houses, made them comfortable. And added paintings. It has been estimated that between five and ten million works of art had been produced during the century of the Golden Age. Very few of these, perhaps less than 1%, have survived.(essentialvermeer.com). The Dutch had a sense of pride: for their country, for their accomplishments and for their houses and culture. They did not need decorations with fancy stories and exotic views. They did not want complicated political statements, nor passionate outcries. They wanted to enjoy their comfortable situation, their new-found peace and prosperity. And so the genre Domestic painting developed, showing households with homely, often peaceful situations. Domestic tasks, physicians, food, animals, paintings, cloth: social life in general. And in those paintings, stories were told. Objects had a meaning, emphasizing love, jokes, moral statements, moods or wellbeing. People in those days were well aware of the meanings, and not everything was what it seemed at first sight. Often, the house owner or one of his family members was portrayed. Through the windows in the paintings, one could sometimes recognize a city or village. “This type of painting did reflect the profound transformations which were taking place in society” (essentialvermeer.com). Cities had their own famous painters, who did not travel far, but got their work then and there. Frans Hals and Jan Steen in Haarlem, Rembrandt van Rijn in Amsterdam, Gerard Dou in Leiden, Pieter de Hooch and Johannes Vermeer in Delft, to name a few. The paintings were rich in both style and subject, as artists achieved new heights of technical refinement, optical and perspectival sophistication, and an often superb evocation of mood. (Meagher). Johannes Vermeer (1632 – 1675) was specialized in painting domestic interior scenes. His beautiful use of light, colour and composition is famous today. He was not a painter who produced a lot of work, which resulted in leaving his family in debt after he died, and neither was he very famous at that time: in 1882 the now iconic Girl with a Pearl Earring (Museum Mauritshuis,The Hague) was sold for only 2 guilders and 30 cents! Most of his paintings were on commission by the more wealthy people or collectors. That was very common those days: painters were seen as craftsmen more than artists. The movie “The Girl With The Pearl Earring” made in 2003, directed by Peter Webber, is a fictional film with some historical truth about Johannes Vermeer, and how his now most famous painting came to be. Has the film re-created the essence of Dutch Domestic painting? It has done a great job in creating the look and atmosphere of Delft, the city where Vermeer resided. The house he lived in was completely recreated in a studio, and by making it bigger than reality to accommodate camera’s and crew, they were able to suggest the viewer is in the house. That is exactly what the Dutch Domestic Paintings do: they allow us, outsiders, to see and connect with an almost intimate view into those lives and livings. The design, decor and lighting of the movie were very much in harmony with the paintings of Vermeer. Of course the film was dramatized: it is not a true story, but based on a novel. Who the girl was, we might never know, though most experts assume it was one of Vermeer’s daughters. The pearl was a fake (Venetian glass fakes were common in those days); and the combination of the turban and the earring was definitely not Dutch, most probably meant to create an exotic look. Like the film, not everything is what it seems. But Dutch Domestic paintings are an expression of an exceptional artistic movement in the 17th century, and give a unique insight into what domestic life in The Netherlands must have looked like. The making of.......But this image is also depicts the painter Vermeer when working on his model "Griet".